Sometimes you’ve had a long and hard week, and you just want to sit back in a comfortable chair and enjoy a nice nightcap. Whether this, to you, means a snug piece of headwear to pair with a matching set of PJs or a fine pour of neat whiskey, come Thursday night it means joining comedic performer Ikechukwu Ufomadu at Joe’s Pub for a night of special guests, gentle quips, live music, and more. As a host and performer, Ike has a demeanor and tone of voice that will simultaneously make you chuckle robustly and feel like a soft blanket is enveloping your very form. Joining him on this evening will be jazz singer Stephan Crump and singer-songwriter LOLO. Some shows have one, maybe two wigs. But nicHi douglas’s vibrant Black Girl Magic Show!, beginning a run at JACK on Thursday, claims to have around 20. 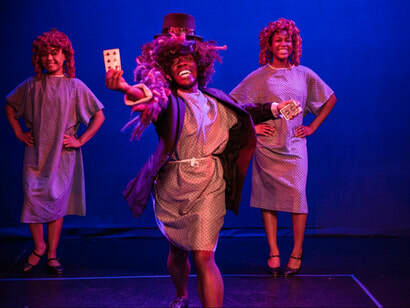 In addition to pleasing the hairstyle aficionados out there, the show also provides a wacky yet educational take on black feminist theory and the African diaspora. This information is dispensed in a multitude of ways, including actual magic, dance, lecture, music, and even a helping of made-up stories. The show is run by The Professor, a character who seeks to investigate having “black girl magic,” not having it, and what that all means in terms of the black woman’s lived experience. Even if this ain’t your first rodeo, this could be your first Barn Show. 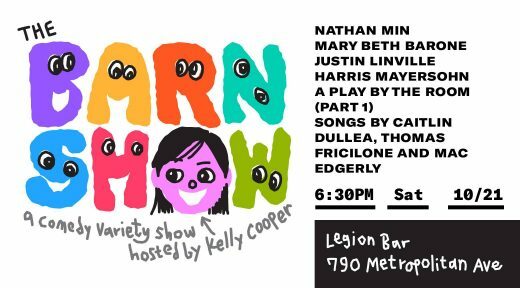 Hosted by Kelly Cooper, this comedy variety show does not take place in a barn, but it does take place in the back room of a bar. 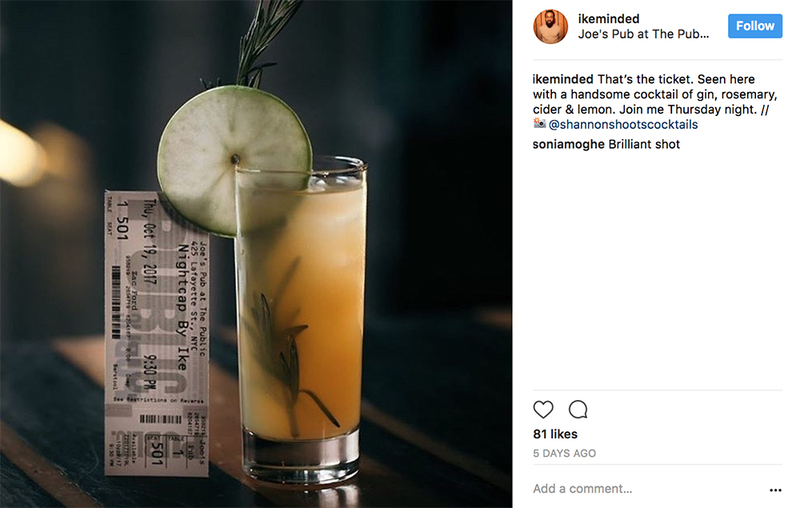 “Bar” is just one letter away from being “barn,” so maybe if you bring a big cardboard cutout of the letter “N” the place will magically transform into a farmland paradise. We can only dream. In the event that this does not happen, there will still be plenty of nice comedy to see from Nathan Min, Mary Beth Barone, Justin Linville, and Harris Mayersohn, plus a portion of a play by a group called The Room, and a selection of songs from The Barn Band, which is a trio consisting of Thomas Fricilone, Caitlin Dullea, and Mac Edgerly, but I secretly wish was a merry band of animatronic creatures. Where did you come from, where did you go? Both Cotton Eye Joe and Joe Rumrill want to know. While I do not know where to find the former Joe, the latter Joe will be setting up shop at Tilt this Sunday night, asking a gaggle of people who have traveled far and wide and maybe even short distances to tell him all about what they have seen, heard, and done. This is all done in an “intimate, taxidermy-heavy environment,” so you know it is going to be a night that is the highest of brows. 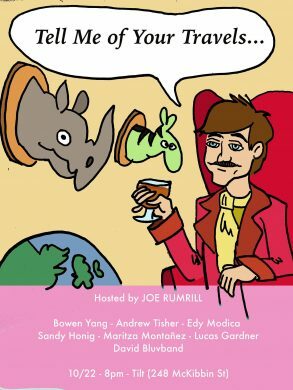 The lucky few that Rumrill has assembled to deliver journey-related jokes and other tales both tall and short include Sandy Honig, David Bluvband, Maritza Montañez, Andrew Tisher, Edy Modica, Bowen Yang, and Lucas Gardner.